Our friend Dimitri Maramenides hung with us a few days with his new Eclipse kites. The Kima is getting the nod from many as THE lei wave kite of this year with amazing turning speed, great stability and fewer struts and thus weight for that extra second to save it while wave sailing toward your kite. Stability and ease of use impressed all our team riders and tester customers. The new bar has a fantastic quick release you can reset with one hand, adjustable end attachments and a very cool grip. Eclipse also has significantly changed the popular Thruster for a great all around, high speed through the window and huge jumping kite with the Nano for the school and freestyle set. 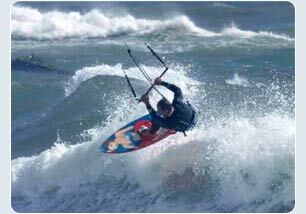 GK returns with our last year favorite GK Trix for wavesailing with a new bar, colors and construction. The GK V Sonic is back with new colors bar and construction. We have always promoted a healthy in diet and fitness, surf lifestyle. A healthy mind and body is what we want for all our customers. Many of the MonkeyAir team are Medical professionals and for years we have spoken of sharing our insights with our friends and customers. Look for info from our docs and therapists for anything from shoulder surgeries to meeting the perfect lifetime sports partner from our therapists on our MonkeyAir healthy living blog. A smile in the surf lineup goes a long way. 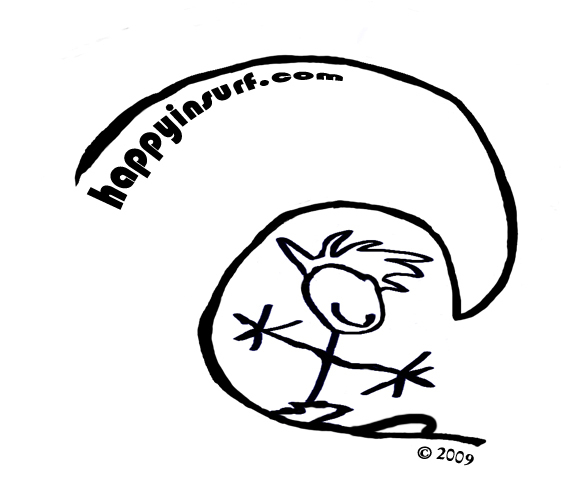 We hope the HAPPYINSURF.COM products remind you and others why we live the happy surfing lifestyle. SMILE, if you are in the ocean, you are a very lucky person. Remember being nine years old and paddling into that perfect wave? The smile on the old crustys, made the experience that much better. Share the happyness. It feels really good. The sticker on the back of your car might remind the rest of the world. best kites since the sport's infancy.